QC Series quick connects are designed to provide a convenient way to connect and disconnect fluid lines without the use of tools. Quick Connects are use in grab sample systems, laboratories, and other applications requiring rapid or frequent connections and disconnections. QF Series quick connects provide full flow connections for applications having up-stream and down-stream shut-off capabilities. 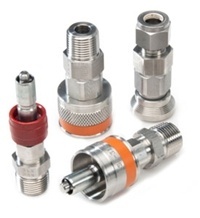 Typical application for quick connect are venting, draining, mixing and transfer applications. Sizes: 1/4 to 1 in.